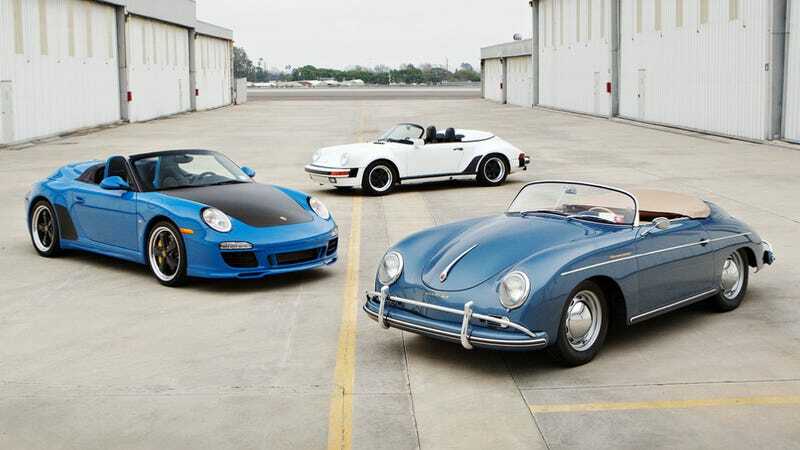 In our slider tool below, you see two almost identical Grand Prix White 1989 Porsche 911 Speedsters. One sold for $209,000, the other for $363,000 at the same auction. The only major difference between these rare 1980s wonders? Jerry Seinfeld. One of my favorite 911s and another of the greatest summer cars of all time. I like the Star Wars Storm Trooper look with a snazzy low-cut top. I’ve had five different ’89 Speedsters over the years in different colors. Loved every one. This one is cool because it doesn’t have A/C. Lighter. One of just 823 (out of 2,065) delivered to the US, this Grand Prix White ‘89 Speedster has 3,800 miles on the clock. It was specified with a Turbo widebody, a limited-slip differential, a black interior with electric sports seats, a Blaupunkt Reno casette player, black Fuchs wheels and a luggage compartment in place of the rear seats. With Jerry Seinfeld as its previous owner, Goodings & Co sold it for $363,000. One of just 823 (out of 2,065) delivered to the US, this Grand Prix White ‘89 Speedster has 6,300 miles on the clock. It was specified with a Turbo widebody, air-conditioning, a beige interior, automatic speed control, a Blaupunkt Charleston radio, white Fuchs wheels, alarm, and a luggage compartment trimmed in black velour. Without Jerry Seinfeld as its previous owner, Gooding & Company sold it for $209,000. In total, Gooding & Co sold cars for $60,162,150 at The Amelia Island Auction, but the Seinfeld Collection didn’t do as good as they’d hoped.